It was a busy night in Canada for fans of Post Edwardian period drama. Last night Vision TV delivered back-to-back episodes of the final two episodes of Season 1 of Downton Abbey, the immensely popular British drama. Coincidentally, the final episode overlapped with Part 2 of the new 4 part Titanic Miniseries. Both shows were penned by Oscar winning writer Julian Fellowes.Which you watched likely depended on whether you prefer your heartache on land or at sea. You better sit for this part. These shows are called dramas for a reason. On Downton Abbey, while Cora loses a baby, and two sisters are spurned, we discover that all that drama is overshadowed by the start of World War I. Meanwhile on Titanic, class clashes in close quarters on the famed luxury ship are heightened by an iceberg with Titanic’s name on it. It’s the Season 1 finale of Downton Abbey (S1E7). Home from spending “The Season” at Grantham House in London, the Crawleys return to their beloved Downton Abbey, their Country House where they will live from July to Christmas. 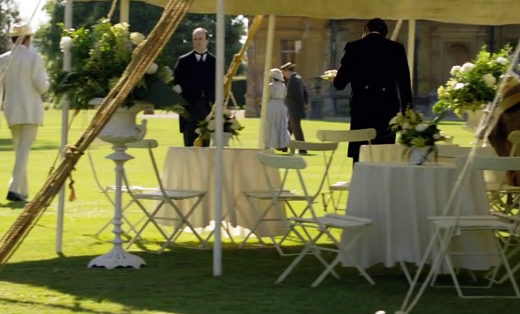 We learn that the Crawleys will be hosting a garden party for the benefit of the hospital. The Edwardians loved the outdoors and entertaining, and gleefully combined the two with great enthusiasm. Society dictated that a owners of a Country House would host a garden party at least once a year in the summer months. Typically it was a late afternoon affair that stretched into the evening hours. Guests would stroll gardens, and possibly enjoy a game of tennis or croquet. Food served at garden parties was simple, yet elegant. Summers dictate lighter fare and food which did not require to be heated. Many of the same items you would find on a tea tray were served at a garden party. 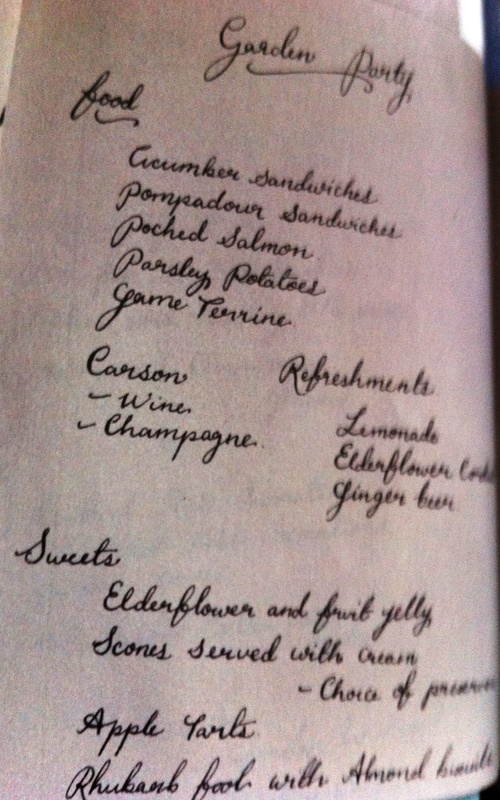 Shown here is an uncredited hand written menu from Jessica Fellowes fantastic book: The World of Downton Abbey. The book is full of interesting tidbits. I have prepared a number of dishes on this blog which you would find at an English garden party. You can easily incorporate these items into your own party this summer. I have provided links to recipes I have already posted, and will add to the list as I add new recipes as the summer season draws closer. Since Canada is the first to see the world-wide release of the mini-series, I decided to watch Titanic, while my husband watched Downton (we both have seen it at least 3 times by now). Thankfully last night’s Titanic episode didn’t leave me with the same indigestion as it did last week. In my usual sarky manner, I compared the series to a gourmet meal which was lacking in flavour. Perhaps I slept better last night because I took a decongestant before bed; that would also explain why I nodded off at one point during the broadcast. This week’s episode told the story from another perspective. Time was spent describing construction and design short cuts of the big ship. An Irish Catholic engineer gets free passage for himself and his family in steerage so they can move to America and start a new life. We gain some insight into the lives of two upper servants/crew members, which I felt was lacking in Episode 1, but still no sign of the orchestrated chaos in Titanic kitchens. There were 80 kitchen staff members on board responsible for feeding all the passengers, as well as the other 800+ crew members. I suppose it was more important to see the frantic efforts to stop the flooding waters in the bowels of the ship than how to make canapes. In their honor I have posted a fish dish from 2nd class below. For me, the highlight of the night is when 2nd Class passenger John Batley, leaning over the rail on deck and feeling sorry for his lot in life, stares in disbelief as a huge iceberg passes alongside him. If you want a review of other Titanic reviews, this is a good one from Periscope Post. 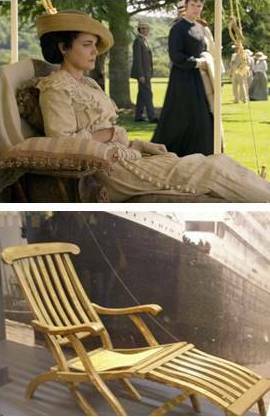 There is a dedicated website for Titanic. You can also view the first two episodes. 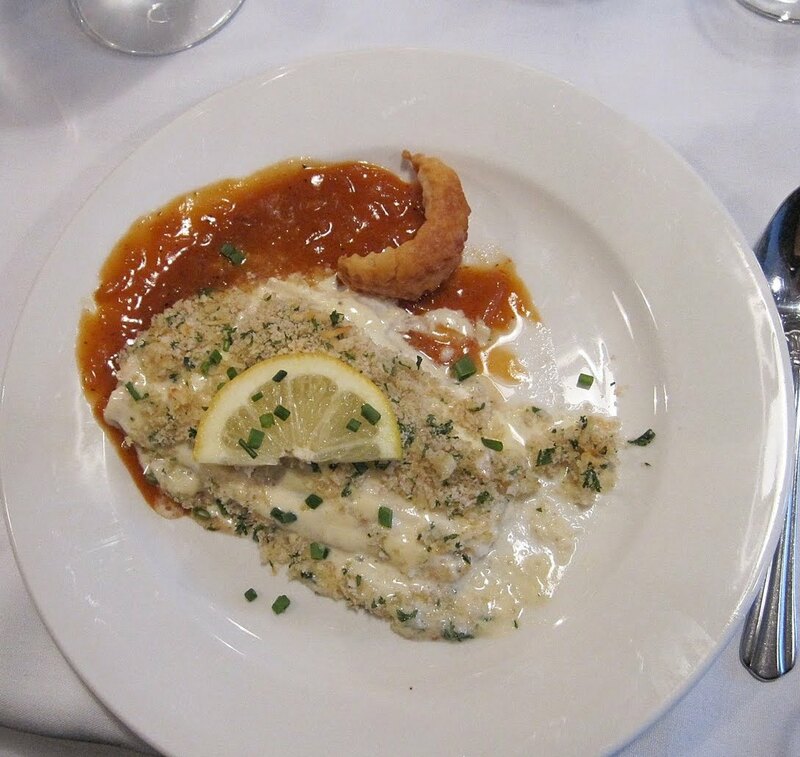 If you are planning a Titanic tribute party for the upcoming 100th Anniversary on April 14, I have provided menus for 1st, 2nd and 3rd class, as well links to a number of recipes. 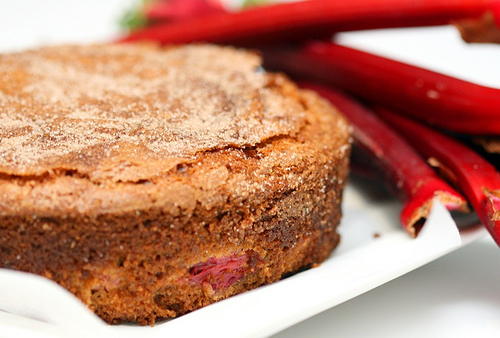 Rhubarb was a huge favorite of the Edwardians and continues to be found in summer dining menus. It was a popular ingredient used in cakes, fools and alcoholic drinks. I will share other recipes in coming posts. Cream the butter, brown sugar, and egg, then mix in the milk & vanilla. Add the flour, salt, and baking soda and mix until there aren’t any big lumps left. Finally stir in the chopped rhubarb. Pour in to a greased 9 inch cake tin. Mix together the extra sugar and cinnamon, and scatter evenly over the cake batter. Bake for 60-70 minutes, or until a skewer comes out clean. In small saucepan, melt butter over medium heat; add onion and cook, stirring often, for 5 minutes or until softened. Increase heat to medium-high and stir in brown sugar, salt, and pepper; continue to cook, stirring frequently, for 5 minutes longer or until onions are well browned. Sprinkle with flour and cook, stirring, for 45 seconds. Stir in water, tomato paste, vinegar, dry mustard, Worcestershire sauce, and hot pepper sauce. Bring to boil and reduce heat to low. Simmer for 2 minutes or until thickened. In small dish, combine mayonnaise and mustard. Place fillets on greased baking sheets. Using back of spoon, spread mayonnaise mixture evenly over top of fish. Stir together bread crumbs, parsley, and Parmesan; sprinkle over fillets. Place fish in 400°F/ 200°C/Gas Mark 6oven for 7 to 8 minutes or until fish is opaque and flakes easily with fork. Broil for 1 to 2 minutes or until topping is evenly browned. Transfer to heated platter and sprinkle with chives. Serve with lemon wedges and sharp sauce on the side.